Iraqi-Americans held a protest yesterday denouncing terrorism in Washington DC. Iraqis protested against terrorism in front of the White House and Saudi Embassy in Washington DC yesterday. 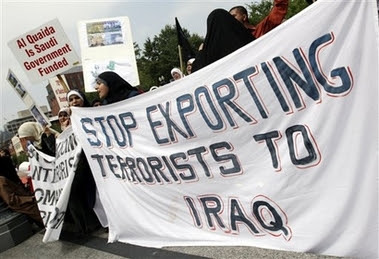 TEHRAN, Aug 25 (MNA)– Hundreds of Iraqis residing in the U.S. converged in the front of the Saudi embassy in Washington on Friday condemning Riyadh’s policy towards Iraq, Sotaliraq said on its website. 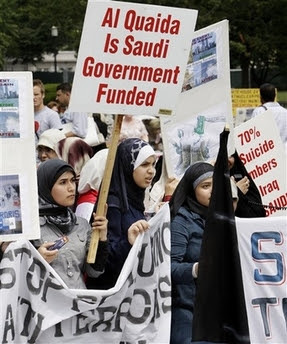 With slogans “Down with Terrorism” and “Shia and Sunni Should Unite in Iraq,” demonstrators called for the immediate halt to Saudi support for terrorism in Iraq and the issuance of “takfiri” religious decrees (fatwas) by Saudi scholars. “We believe that by issuing takfiri religious decrees and financial support of terrorist operations, Saudi Arabia is the real source of terrorism, not only in Iraq, but in the entire world. 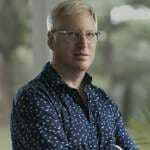 We read in the press that 50% of suicide bombers in Iraq are Saudi nationals,” he explained. 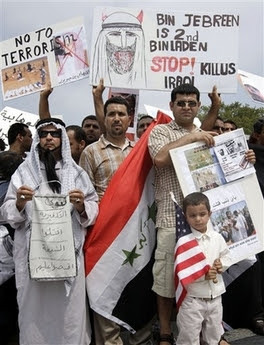 In a statement issued by Iraqi demonstrators, they called upon the U.S. to pressure Saudi Arabia to stop actions leading to the murder of innocents. “We tried to submit a copy of the statement to the Saudi ambassador to Washington, but he refused to accept it,” Heydar noted. UPDATE: Here are more photos from an earlier protest on June 22.